The message style varies from browser to browser and the one shown in this picture is taken from Google's Chrome browser. As you can see, message "Please enter an email address." is shown when the user enters an invalid email address and clicks the submit button. This message is shown inline with the input field. 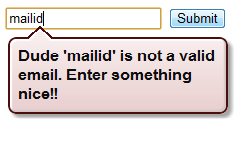 Similarly the custom validation message can be set in various conditions, such as required filed not entered - element.validity.valueMissing, element value doesn't match the pattern - element.validity.patternMismatch, value is lower than the provided minimum - element.validity.rangeUnderflow, value is higher than the maximum - element.validity.rangeOverflow. One can set such validation messages in various use cases as well. Say, when the entered text is not one of the expected values or when the confirmation email address doesn't match with the original email address. In such cases showing a custom validation message comes very handy. Thanks for the useful guidelines, I am sure it will be helpful both to my brother and I - we are only beginners in API, but I hope with this tutorial we will figure everything out - as they say, two minds are better than one. Once again, thanks for posting! can u please put up a demo for this, seems this code doesn't work...Indeed I copied the same code snippet into HTML5 page, it din't work!! The check function is same as mentioned in the blog post. Let me know if this works for you. Yes it works, Thank u very much for the wonderful code. Is there any way to change the look and feel of the error bubble? Thanks it saves my time. Check this website link https://college-homework-help.org/blog/bibliography and you will have a lot of writing solutions! Is this what are you looking for? It was very great and useful content, I look like your innovative article. Thanks for providing the unique details and keep it up a good job. I would like to thank this blog admin for sharing this worthy information with us. Keep doing more. This is what I was looking for, thanks. Only professional writers can make such material. I really liked it. Finish university with a red diploma. This is possible thanks to pay for custom research paper. Take advantage of our services. Learning is easy.